I love fish tanks. I think they are beautiful and an aquarium is a great zen-like accessory to any home or office. The only problem is that I tend to go through fish with frequent regularity. Clearly, I am doing something wrong. After seeing multiple R.I.P. posts about my fish this past year, PetSmart reached out and begged me to come in for some tips on how to properly set up a fish tank, so they could save me from killing more of God's innocent creatures. You must leave a separate comment for each item you utilize above, so I know how many entries you get. Since I know some of you are blog-comment phobic, comments can also be left on my Facebook Fan Page, or via Twitter. I just need to be able to track what you did so you get the correct number of entries. Leave your comments on whatever social channel you prefer. 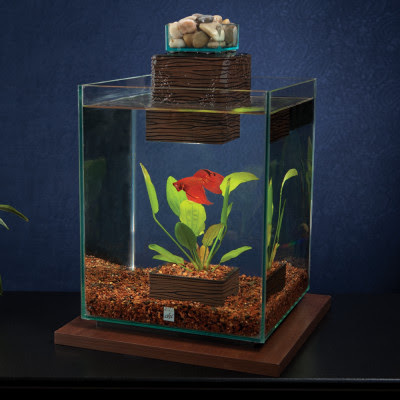 The winner of this aquarium will be selected at random Monday, March 7, 2011 at 12:00/midnight Central time and the winner will be notified by email on Saturday. The tank will be shipped directly to you. Disclosure: The Fluval Chi Aquarium was provided to me free of charge by the wonderful folks at PetSmart. This post reflects opinions that are my own.